Where Are the Best Places to Buy a Cat? When you're ready to adopt a new pet, it's important to do your research on the best places to buy a cat. From animal shelters and rescues to breeders and pet store, every option has advantages and disadvantages that need to line up with your own priorities. If you feel called to save a life, going to your local shelter is a wonderful way of finding a new cat. You can find all ages of cats and aren't limited to just kittens. You can find local shelters in your area using the ASPCA shelter locator. The price is generally low and often includes a veterinary check-up, microchip, vaccines, and the spay/neuter operation. Some shelters even have special adoption days where prices may be reduced or even free for seniors or harder-to-adopt cats. According to Petfinder, expect to pay around $200 or less. Fees will vary based on the age of the cat, with kittens costing more. You get to help a cat that needs a home and make a space for another cat at the shelter. There's a wide range of ages, colors, and personalities to choose from. Fees are low compared to buying one. You may not find a specific type of breed you're looking for if you want something more uncommon or exotic. If you want a kitten, there may not be any available at the time you look. Cats in shelters are stressed and may seem shyer when you meet them. They also are at higher risk of disease from being kept in close quarters to other cats and the high stress level. Rescue groups differ from animal shelters in that they are privately run. Some have their own physical shelter whereas others house their cats in foster homes. You can find local rescues using the Petfinder website. Rescue groups charge about the same as a local shelter although their fees may be a bit higher. Since these groups do not receive government funding and are non-profits, they may need to charge more to cover the cost of caring for their cats. Kittens also require more care, so their adoption fees are higher. As with a cat from a shelter, you're bringing home a cat in need of a home. Some rescues specialize in specific breeds, so you may be able to find the purebred you're looking for. The cats often live in homes and are much less stressed than cats living in shelters. They can give you a good idea of the cat's personality as they live with it every day. Many times, they live with other cats as well as dogs and children so there's a good chance the cat is well socialized. Rescue groups are often run by volunteers so it may take longer to go through the adoption process. 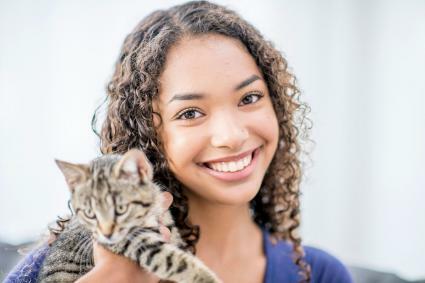 Rescue groups may have more stringent adoption processes compared to a shelter, and you will be required to fill out an application, provide veterinary references, and even possibly undergo a home visit by a volunteer. Just as with shelters, there may not be a lot of kittens as these get adopted out very quickly. If you want a purebred cat of a specific breed you can't find to adopt, then a reputable breeder is the way to go. You can find breeders on the websites for the Cat Fancier's Association, International Cat Association, and the American Cat Fancier's Association. You can also visit cat shows to meet breeders and see their cats in person. The cost of a purebred kitten varies based on the breed. Persian kittens are on average $1,000 to $1,500 or more while an American Shorthair kitten runs from $600 to $1,200. Siamese kittens are about $400 to $600. The rarer the breed, the more you will pay. If you want a "show quality" kitten, you may pay as much as $15,000. If you have your heart set on a specific breed and it must be a kitten, a reputable breeder is your best choice to find one. Kittens will most often be raised in a home by the breeder and carefully socialized. A good breeder provides the kittens with proper veterinary care and vaccines. Breeders may also have older cats available if you're not sure a kitten is right for your lifestyle. A cat from a breeder will be more expensive than a cat from a rescue or shelter. You may also have to travel farther to find a breeder or have the cat transported to you for an additional cost. There's a chance you may find breeders who are not responsible and provide poor care for the kittens, leading to sick and stressed cats. While not a bad thing, the process to get a cat from a breeder may be more intensive than that of a shelter. Reputable breeders want to make sure they are placing their cats in the best homes. Getting a cat from a pet store can carry some stigma with it, but it depends on how your local pet store operates. Some sell cats whereas others house adoption groups. For purebred cats sold at a pet store, you should expect to pay a bit more than what you would pay to a breeder. If the pet store adopts out cats, then expect to pay the general rates for a rescue or shelter cat. If your pet store doesn't sell cats but instead lets rescue groups show their cats for adoption, this is a convenient way to adopt a pet without having to go to the shelter. Pet stores that encourage adoption will often include a store incentive as well such as a special discount or package for people who adopt a cat at their store. Pet stores that sell cats may be getting them from a "kitten mill" which mass produces kittens with little regard for proper veterinary and behavioral care. Kittens in pet stores may not receive optimal socialization and health check-ups and can come home sick. If you decide to buy from a store, make sure they have health guarantees and ask to see the kitten's medical records. The "want ads" in newspapers of the past are now found in places like Craig's List, Facebook Marketplace, and local buy-and-sell Facebook groups. You can often find cats and kittens listed for sale and adoption here. While there are many problems associated with cats from these places, every situation is different. You will find pricing all over the map, with some people giving their animals away for free whereas others will charge anything from a small rehoming fee of $100 to several hundred or more for purebred kittens. You can find a nice cat or kitten for a reasonable cost if you ask questions and do your homework. Cats on these ads, especially older cats, have often lived in homes, and the sellers can tell you more about their personality. These may be cats that are well loved but need to be rehomed due to allergies or a family crisis. Both reputable and irresponsible breeders will use these forums to advertise cats, so you need to be vigilant when meeting the cats and the breeder. Ask lots of questions and do not go forward if the cat looks ill or appears shy, aggressive or otherwise behaviorally and medically unsound. "Hobby" breeders generally won't have the same stringent requirements such as a contract, health records, and an interview with you. You may be "rolling the dice" by getting a kitten from a hobbyist or backyard breeder or someone who's cat had an accidental litter. In addition to shelters, rescues, breeders, and want ads, there are other places not as widely known to find a cat. Check your local veterinary offices. Many have cats and kittens for adoption that either came to them through a client or strays that were brought in to them for care. Ask friends, relatives, and coworkers if they know of people either having a litter or who have a cat they need to rehome. If you live in a rural area with farms and horse stables, it's not unusual for these places to have "barn cats" that live on the premises and have litters. The owners may be happy to have you take one or more kittens off their hands, but be sure to get them a health check-up right away. Local realtors may know of cats available for adoption from clients who need to sell their home and move and cannot take their cats with them. In areas with a lot of foreclosures, cats and other pets can be abandoned in homes and realtors sometimes will care for these pets while finding them a new home or bring them to a rescue and "sponsor" them for adoption. Sometimes people end up with a cat by simply taking in a stray that shows up on their doorstep. If you find a cat that appears friendly, always contact your local shelter to see if it has been reported missing and put signs as well. Any shelter or veterinary office can scan the cat for a microchip as well. If the cat is not claimed after a certain amount of time, this is one way to bring in a new feline friend that depends entirely on circumstance. In these situations, make sure you get a veterinary check-up, vaccines, and a microchip ASAP. There are lots of options for the potential cat owner to find a new friend. The best place depends on the type of cat you want, whether you believe strongly in rescue, and how much you have available to pay. Finding a cat for free or very little money can be very risky although there still can be good cats to be found in these situations if you're careful and take your time looking. 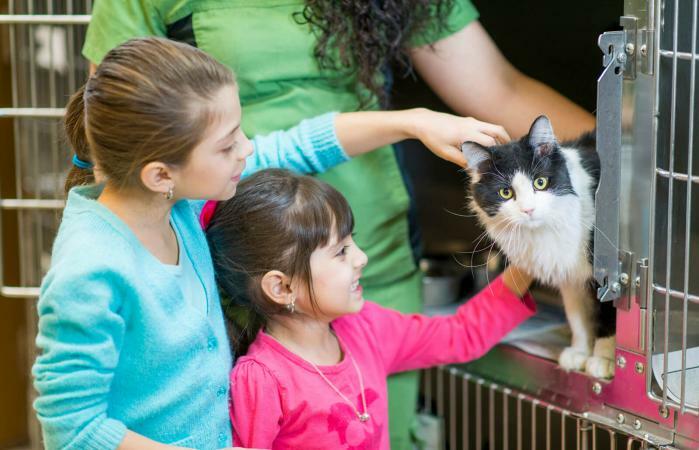 Using a shelter, rescue, or breeder with veterinary check-ups, socialization and care are the safest routes to finding a healthy and happy cat.